How to stick together balloons? 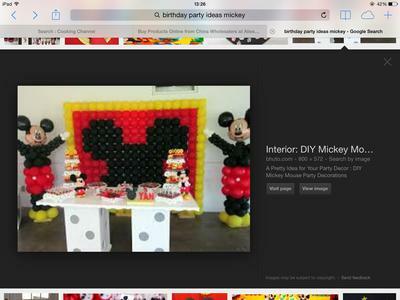 I would like to arrange balloons as seen in the pictures attached. 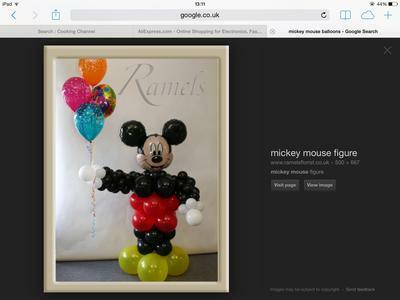 The Mickey Mouse balloon sculpture shown in the pictures is done with the same technique as a balloon column. First, you will need a sturdy base and frame. Then you'll need latex balloons in various sizes. After blowing them up and tying them together to 4 balloon clusters, you attach the clusters to the column pole. We have instructions how to create a balloon column here. I am not quite sure how they did the arms. I think they are using aluminum rod, bent into shape and attached to the pole. I also found this video tutorial that shows how to create a similar type of Minnie Mouse balloon sculpture.